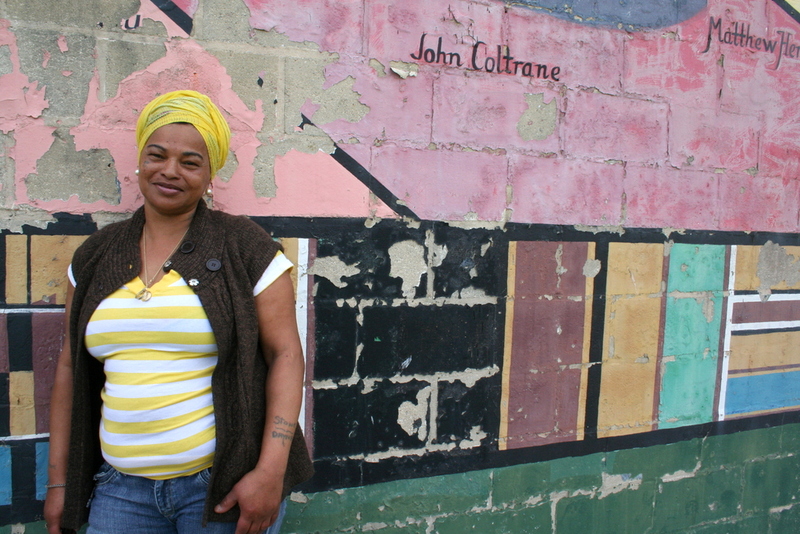 Above: Dayna Thomas, next to mural on Carey Street, across from Penn-North Community Resource Center. As Baltimore continues to reel in the aftermath of Freddie Gray’s death, at Penn North, the epicenter of the rioting and a zone now patrolled by armed troops, there was an island of calm yesterday morning. The soothing oasis was inside an unassuming brick building at 1610 North Carey Street, home of the Penn North Community Resource Center. Residents and staff see the drug treatment and recovery facility as a spiritual sanctuary, not only for those who want to stop using drugs, but for a neighborhood impacted by them. Outside the building, new sources of stress challenge the center – the soldiers, the looted CVS pharmacy, the volatile crowds on the streets. 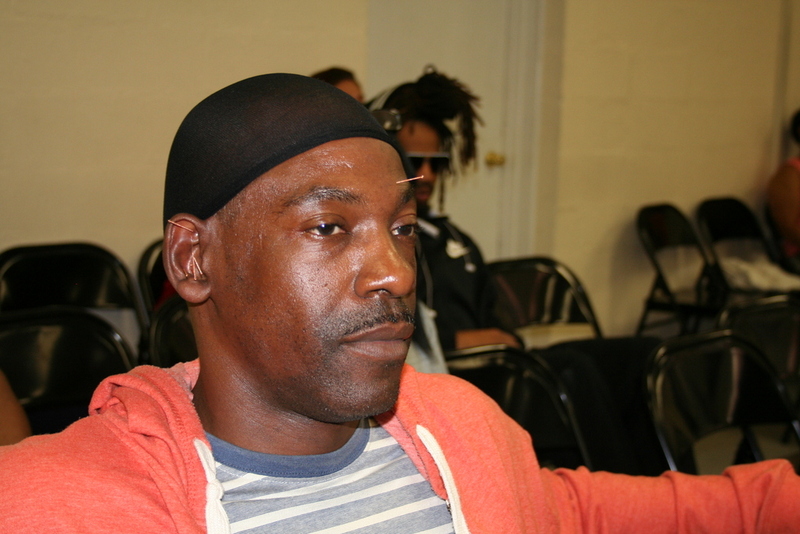 Valentino (who didn’t provide his last name) was one of about 50 people who attended the center’s acupuncture and meditation clinic intended to help them deal with stress. Acupuncture also aids those who are detoxing. He was asked, as he sat in the clinic with needles protruding from his head and ears, if the acupuncture helped? The treatments have helped him greatly, he answered graciously, as he tried to relax with a reporter asking him with questions. Valentino has been doing acupuncture at the clinic for about a month now. Blaize Connelley Duggan, who directs the residential and day treatment center, said it is a hub of community life in an area that has few amenities and struggles with multi-generational poverty and drug problems. The center is one of the few places now open in Penn North. Today, she said, the center offered free acupuncture to the entire community. Dayna Thomas, an employee and graduate of the center, said she understands the rage of some of Baltimore’s young looters. “At their age, I probably would have been out there looting too,” she said. 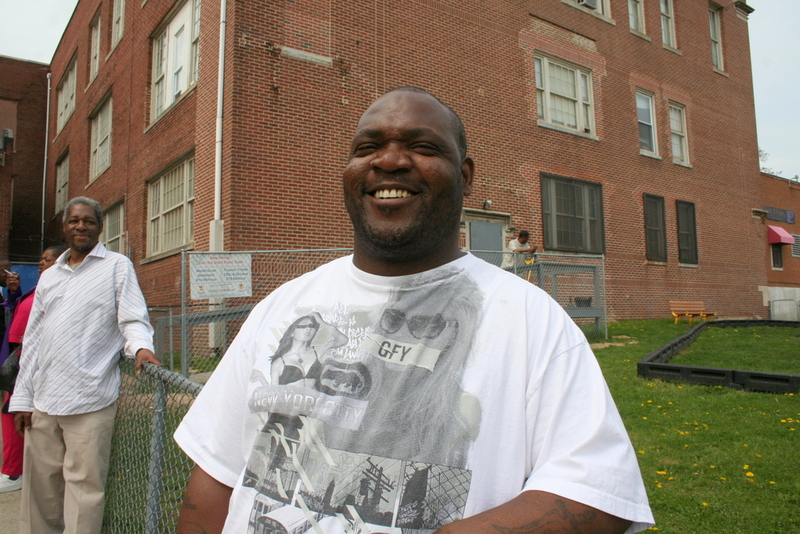 Thomas, 51, said she grew up in Baltimore’s drug culture and has been in every jail in the city. “I was on the streets from age 14, by choice, running with girls who knew how to steal and shoot dope,” she said. As Thomas grew older, she was close to drug dealers, but eventually stole from them and others to support her escalating heroin habit. “Near the end of my drug use, I was also selling my body,” she admits. Her recovery has given her the ability to manage her anger – “to lose some of my street mentality,” she said – as well as feel loved and gain employment, a cornerstone of her continued success. “Nobody gave any thought to what would happen [to the community] after the fact,” she explains. Tyrone Trotman, who got off drugs at the center five years ago after a lifetime of hustling, agrees with her assessment.